Sometimes things are meant to be. It often seems that the when worst thing in the world occurs to me, I'm thankful weeks later. This may be one of those times. Scott's illness was a huge disappointment for both of us. Huge scoring opportunities in his favorite events, on a great hill... all lost. However, there will be other opportunities like these in the years to come. We mustn't lose sight of Scott's season goals. The major event of the year for athletes his age is the J2 National Championships, being hosted by Sugarloaf, ME this coming week. Everything we've done since last April is focused on succeeding next week. I can already see where a full week of competition in Aspen, followed by driving across country in 48 hours, might not have postured Scott for success at J2s. Scott spent 10 of the past 11 days resting. He stayed indoors, took his meds, slept long nights, caught up on school and visited with his mother. All good things. He also worked out hard for 2+ hours each day at the local gym. Provided his VO2 is recovered, he's probably in his best best shape since October. Nothing like rebuilding mid-season! We're hoping that the rest and drugs, plus the fact that we caught the pneumonia in its early stages, will reduce the lung damage. Coming from 10,000 feet down to sea level doesn't hurt either! Meanwhile, I took advantage of this break to add two days to the travel plan and leave early for the East coast. I'm in Boston now waiting for Scott's flight to arrive -- more rest for him. In retrospect, there's no way we could have safely made the drive in two days; I'm glad we didn't try! So we go to the big Championships with lots of questions that will be answered when Scott hits the snow on Tuesday. Fortunately, he'll have three days on snow before competition begins. We're cautiously optomistic. Drugs aren't the answer... After three days of antibiotics and rest, we hoped Scott would be ready for today's Super G. Not so! He says he felt OK for two turns, then got weaker and weaker in the course. By the time he was halfway down he couldn't breath, was getting tunnel vision and was dizzy. Nice time to hit a jump at about 60 MPH. He doesn't remember much except twisting in the air and cartwheeling for quite a while. The end result is evident in the photo, a bent ski and broken binding. Guess it could have been worse. Atomic sends us replacement skis -- they don't do arms and legs though. So now we're left with few good options. I pulled Scott from tomorrow's Super G for safety and health reasons. He needs time to recover from the pneumonia. We may wind up just sitting here in an Aspen Condo all week getting well for J2 Nationals. Its a bitter pill given that Scott loves speed events and this hill. There are huge scoring opportunities here this week as well. But we can't lose sight of which race series are the most important to his career. Last night Scott mentioned his chest felt "heavy" and he hoped he wasn't catching my cold. This morning he repeated the complaint and added that he was light headed. Uh oh... immediate action required, sort of like a blown car engine! We stopped by Emergency Care in Heber City, UT and he was diagnosed with Pheumonia. They looked under my "hood" as well and I'm there too. Three hours later, after respiratory therapy, needles and antibiotics we're back on the road. Scott's is limited to the base of his right lung. Mine is all over. We're optomistic that three days of antibiotics and rest will get Scott to where he can race the NORAM speed next week. We'll probably have to arrange something over his mouth so the air warms a little before inhalation. I have an easy week as Finish Referee for the events, so I can pace. Life just got a little more complicated. The Good -- This week leaves no doubt that Scott can knife the hardest ice. 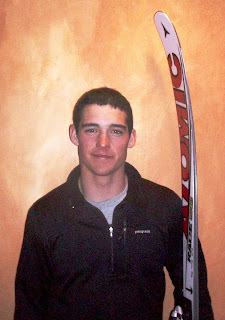 He skied with great strength and confidence in all events. The Bad - In the first of two Slalom races today Scott was attacking the steepest pitch on the course, carving all the way, when his inside ski tip centered on a gate. His ski instantly released and he fell flat on his face. In the process he overtook the unattached ski and rolled over it the length of his body. The Ugly - The end result was a deep bruise to his hip and thigh. We tried working it out before the second race, but the shots of pain made it impossible for his quads to fire reliably. He pulled from the final race. The week was not a loss as Scott got to train and compete on an injected Olympic venue. This was a great confidence builder for the coming championships in Maine, Vermont and New York. It was also fun to be part if the Olymoic tune-up and be in the same race with the big boys. We enjoyed the afternoon off, tuning all the skis for the next event and packing in leaisure. Scott ice skated two hours just to keep the legs moving. We hit the road to Aspen tomorrow and look forward to seeing our great friends and supporters JJ and Laura for a brief visit. The field here turned out to be deeper than we expected. In addition to the US Olympians and the remainder of the US team, the Swedish Olypians were here, plus about fifteen elite athletes from eight other countries. In all there were 78 athletes, with Scott the youngest. Scott skied well in the first run, moving from 59th to 24th place. The second run he picked up some more spots and finished 20th overall. This was a huge result for him given that it was in front of the US coaches and hierarchy. He's pretty excited. Tomorrow he has another Giant Slalom, then Wednesday two Slalom races. Can't wait! We're in Park City, UT getting ready for the NDS races. The Olympians are returning to the US for a four race tune-up this week. The rest of the US team plus selected invitees will participate. Not only is this a unique opportunity, but the points should be pretty good. So Scott and I came down two days early to prepare. Mostly I wanted to get him on the race hill (which is heavily injected with water) and feel the surface. 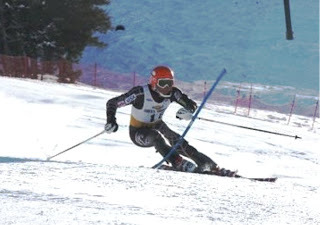 We ran Giant Slalom today and he's ripping, so tomorrow will be a "day off" with school and physical training. Scott broke both pairs of his slalom skis last week. Atomic rushed one set directly here to Park City, and the other set should arrive any time. So my entertainment today was six hours of set-up and initial tuning. I have three days to get about six more coats of wax into the base before the slalom races on the 17th. Ah, another ski vacation! The stop at Snow King was successful. Scott skied strongly, and despite some baubles was able to score in both Giant Slaloms. He also was .34 off the lead on the final Slalom run. In all he won three J2 Golds. These results, combined with his speed results at Mammoth, made him the top Western qualifier for J2 Nationals next month. So now we're home for three days before embarking on a 45 day road trip. Scott trained one day, but will rest the remainder of the visit. While he tries to get ahead on schoolwork, I'm doing a full renewal on eight sets of race skis. This is a good chance to reload the bases, polish sidewalls and fine tune the edges. Every race from here out is important. Being home is great! Naturally, being with Joy is the best, but it's also fun to run into all of the locals as we run errands and so forth. The folks in this town are very supportive of Scott and show genuine interest. Scott had a good two days of downhill. After winning the training run, he had a hiccup on the first race, finishing third. The snow peeled off just as he lined up for a jump, causing him to land a few feet over from where he wished. The penalty was being off line entering a sweeping turn. It doesn't take much! The second day went very well, with Scott taking second, .17 off the lead. So we leave Mammoth feeling pretty good. We drove hard after a full day of racing, and made it to Elko, NV by midnight. We chose the short route across some pretty desolate areas. The push was needed so we could have breakfast with a dear family friend whom I coached years ago in Alaska. Of course now she's a Mom with two beautiful kids (see photo). There are some drawbacks to this life we live, but getting to see friends is a big plus! We resumed the drive and at 11:30 AM our engine blew up about 40 miles south of Twin Falls, ID. Not many options so I went into crisis management mode. We negotiated a new Outback over the phone, called a wrecker, coordinated repairs, and were back on the road in a new car in less than 3 hours. There's no time in our schedule for delays. So now we're the proud owners of a spare Subaru which we'll pick up in March on the way back across country. Gotta love it!